This past weekend I had the opportunity to sell some books in a huge mall in Saskatoon. I will admit that it was a little slow, but most of the people I talked to were really interested and looking forward to reading my books. My wife has taken on the job of being a sort of manager for my writing career. She has taken the time to make business cards, bookmarks and even t-shirts to help get the word out about Lorne Oliver and his novels. (yes I went 3rd person there, so what?) I want to thank her for all of her work. I did get to witness a dream as well. 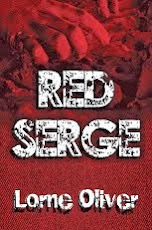 A gentleman bought my novel, Red Serge, to read while his wife was shopping. He sat down on a bench and got right to it. No, he's not headless. I'm not too sure where I will be going next. I am in talks with several bookstores across the country. Until then I will keep writing. great to see a dream come true.